Introduced in 2009 Steinbach has introduced a Junior Merlin Nutcracker. 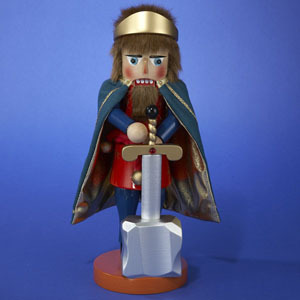 This nutcracker is an exclusive limited edition of 5,000 pieces. 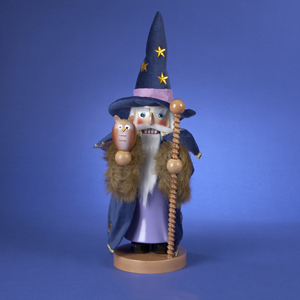 Standing at 14 inches, Merlin is dressed in his magic hat and cape. He holds on owl in his right hand and his staff in his left hand. 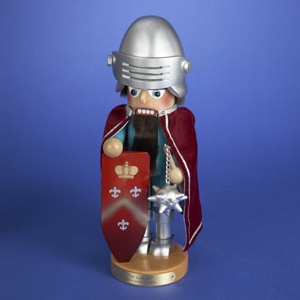 The Junior King Arthur (ES1303) Nutcracker was introduced in 2010 and is an exclusive limited edition of 5,000 pieces and stands at 14". Arthur was the first-born son of the King of England and heir to the throne. Due to the troubled times the King’s advisor, Merlin the magician, advised him to send Arthur away to keep him safe. After the King died there were conflicts over who was the heir. Merlin used his powers to set the King’s sword into stone; the man to remove the sword would be King. Thousands of men tried their luck but none could pull the sword until Arthur tried. When he removed the sword he became the rightful king. Over time Arthur created the Knights of the Round Table and along with his wife Guinevere ruled over Camelot.